Figure 1: I always enjoy getting a red box in the mail. 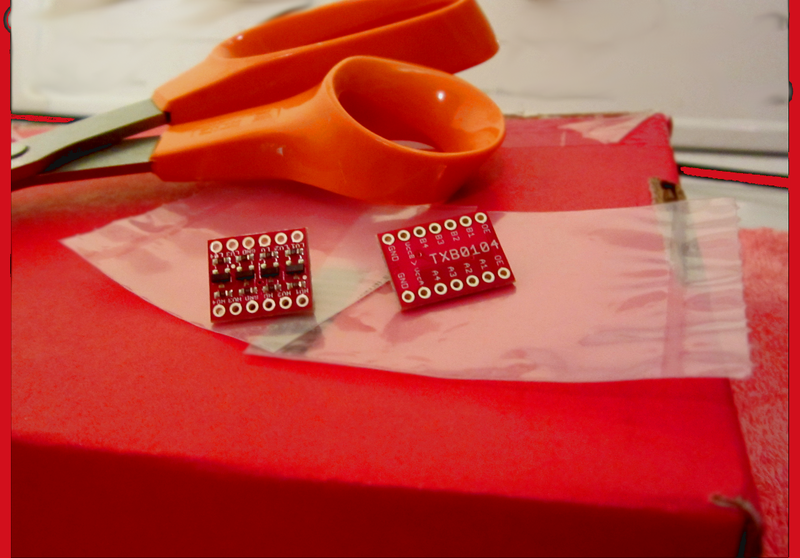 Sparkfun’s shipments come in fun colors. So, today’s mail brought some goodies to be used with the Odroid XU4, in order to have GPIO capabilities. I looked for the most economical level shifters I could find. It was necessary to use the shifters, since the Samsung Exynos 5422 system of things uses 1.8 VDC logic. Most everything else I have uses 3.3 VDC, and the two don’t mix well without the shifters! Unfortunately, it was necessary to purchase different shifter parts, depending upon the application. Fortunately, they are inexpensive enough such that it doesn’t matter. For UART and SPI level shifting, I purchased the Sparkfun part BOB-11771, which does not work for shifting I2C peripherals. The BOB-11771 is a breakout board for the Texas Instruments TXB0104 module. For I2C shifting, I purchased Sparkfun part BOB-12009, which also works fine with the regular non-communication sort of GPIO (as does the BOB-11771). The parts were each less than $4, in quantity=1 volume. Actually, the BOB-12009 was $2.95 at the time of this writing. No problem! Figure 2: “Self stick” flooring tile, used as a circuit board floor. Click to enlarge. This project is more than an exercise in converting 3.3 and 1.8 volt logic levels. It also involves building yet another homemade tablet. I have four of them now (2 Pi2’s, a C1, and a C1+). The fifth one (being this XU4) will be the most powerful of the bunch. So, in figure two we can see I’m beginning to lay out the new tablet. Nothing is hooked up or soldered. One of the main things I decided about the XU4 based tablet, was that it needed a full circuit board floor. 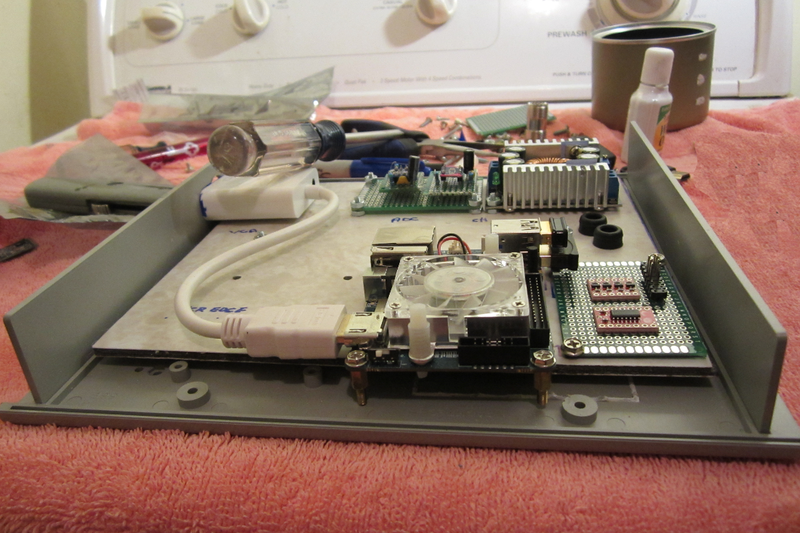 As the figure shows, (front and center on my usual workbench – my washing machine), the circuit board floor is visible, as it has been installed into the fledgling tablet. It is fashioned from two pieces of self-stick flooring squares, stuck together for extra thickness and strength. This ensemble is attached to two thru-screws, and two more screws that are affixed only to the plastic sleeve protrusions molded into the case. By the way, this is the same case as was used for the Pi2 powered tablet (tablet #2). The two logic level shifters can be seen in the lower right hand corner of the photo. They will be used for (among other things) – attachment to the 3424 ADC chips shown in the top-center portion of the photo. In the upper right hand corner is the DC-DC converter. The first homemade tablet used a false-floor on only about half the workable floor space of the little enclosure. That turned out to be insufficient. In tablet #2, I used no false floor at all – and its bottom is peppered with screws as a result. So, in this incarnation, I’ve decided to use a full floor. Instead of using the scrap from the LCD screen cut-out, which of course is smaller than the available floorspace, I purchased two floor squares at a home improvement store for 99 cents each. I intend to have a pretty intense thermal environment control setup, for keeping the temperatures under control, maybe involving the addition of an extra Noctua fan for that purpose, so I don’t see that softening of the tiles is a likely issue. Nevertheless, none of this should be taken as advice, and my material re-use/repurposing is not intended to be something that encourages others to do the same. Note the nuts on the double-nut bolts holding the base proto-board in place (the mount board for the ADC boards). Those all must be touched with threadlocker so that they cannot vibrate off of the bolts. Sparkfun is a trademark of Sparkfun, Inc at https://www.sparkfun.com, and they have no relationship with this author or site. Odroid is a product made by Hardkernel at http://www.hardkernel.com, and they have no relationship to this author or site. “Raspberry Pi” is a trademark of the Raspberry Pi foundation, and they have no affiliation with this author or site.